As a writer of historical fiction, I’m challenged with describing a world that no longer exists. One of the ways I transport my imagination into Regency England is by seeing items from that era. 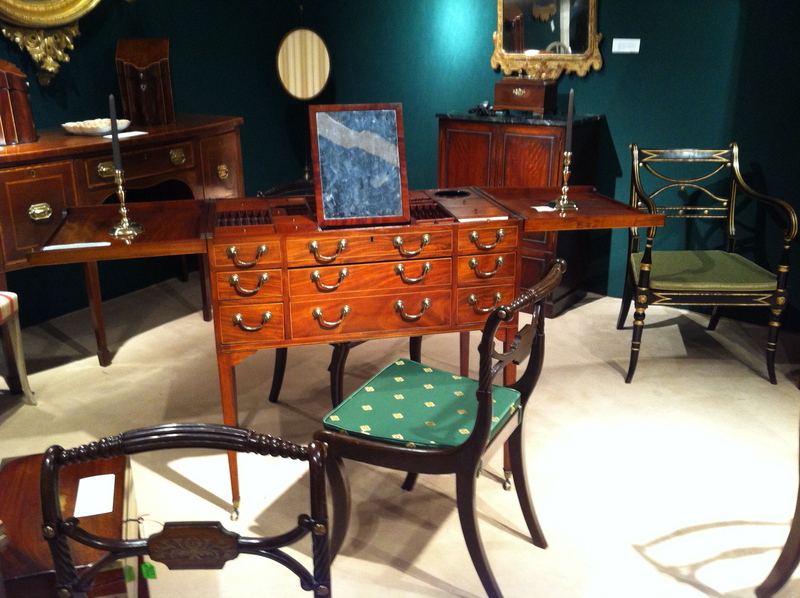 At this year’s Winter Antiques Show, held annually in NYC, there were many exhibitors that presented beautiful pieces of furniture. The Hyde Park Antiques stand is a favorite stop of mine. Perhaps it’s because I am a writer, but I always find myself drawn to antique desks and books. 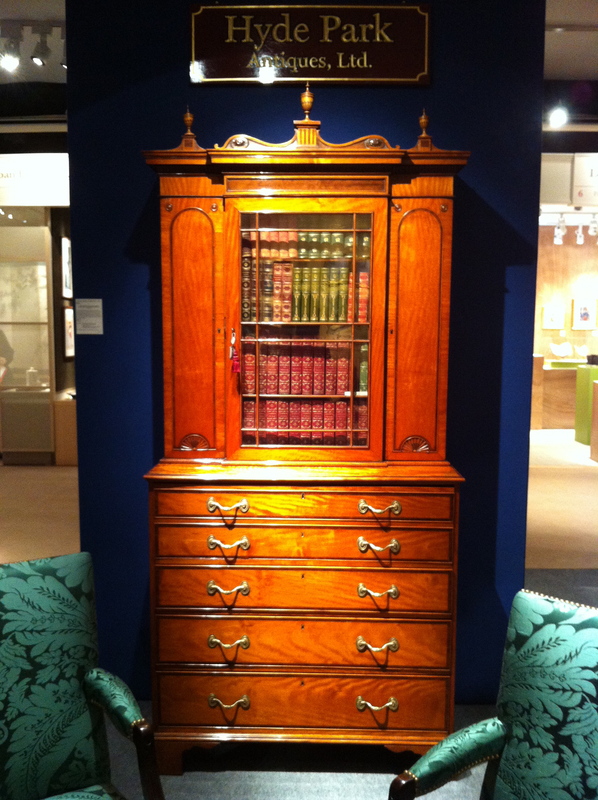 The moment I walked in their stand, this George III inlaid Secretaire Bookcase c.1790, made in England, caught my eye. The allure of an antique dressing table is another siren call to me. This lovely beauty was found at Alfred Bullard. Each year, I look forward to stopping at their stand to see what treasures they have. They always have many beautiful pieces, and their staff is so knowledgeable and personable. This George III mahogany dressing table, made in England c.1800, has satinwood inlaid borders on the rectangular double hinged lid. The lid hides a ratcheted, sliding hinged mirror and a fitted interior that has an arrangement of small covered boxes, open trays and wells. The table is supported on square tapered legs with brass castors that rise to shaped corner brackets. 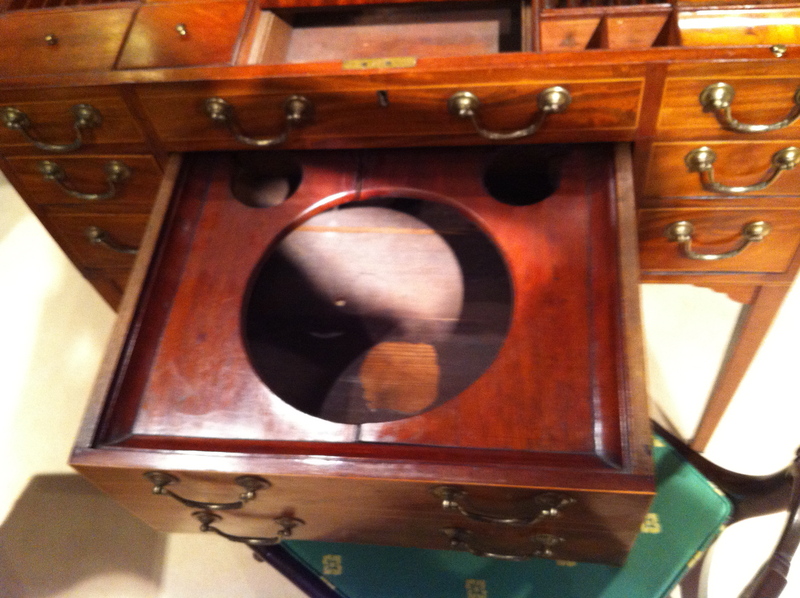 One of best parts of this piece is the central deep basin drawer which was disguised as two drawers. That large round opening would have housed a wash basin and the smaller holes would have held small dishes for soap. It was interesting to see that a woman could execute her toilette using just this one piece of furniture. The last item I wanted to feature might hold special interest for Regency enthusiasts. 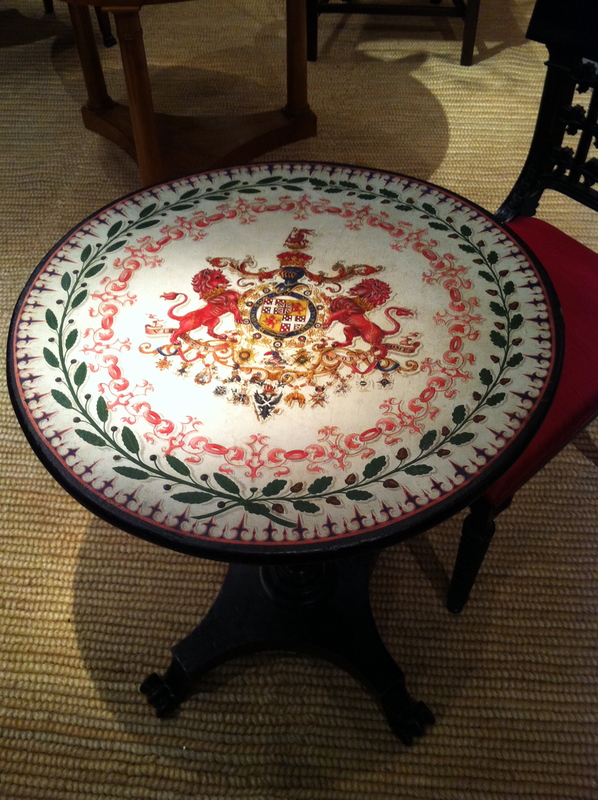 It is a small round table with the Coat of Arms of the Duke of Wellington and was made in England in 1830—the same year he resigned as Prime Minister. 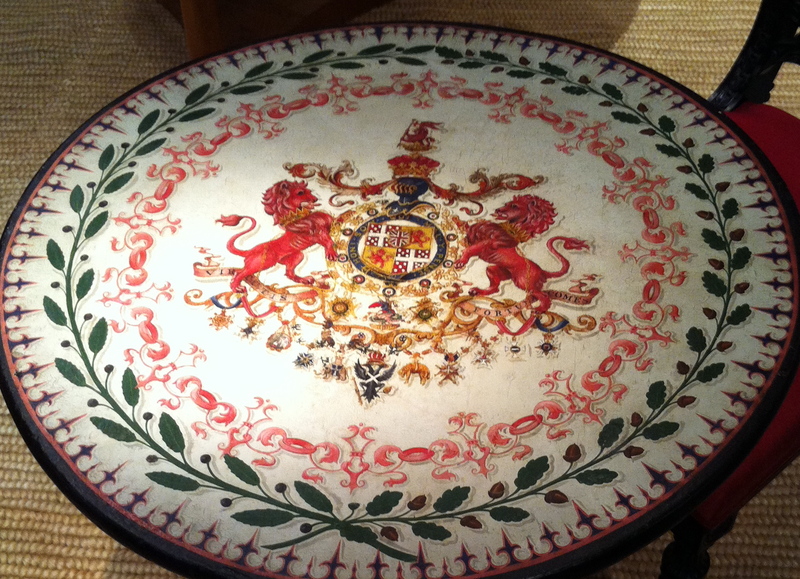 This polychrome painted, tilt top occasional table depicts the Duke of Wellington’s Coat of Arms and Honora from various campaigns. The arms and medals on the painted top are all honors bestowed on the Duke of Wellington. Below the motto “Virtutis Fortuna Comes” (fortune is the companion of valor) hang various medals, including the Golden Fleece and Austrian, Spanish and Indian honors. All are representative of victory titles granted to the Duke for his distinguished military service in the Peninsular War and at the Battle of Waterloo. Next week, I’ll post my final highlights of the 2014 Winter Antique Show and give you a glimpse of some of the lovely portraits I discovered during my visit. What beautiful pieces! I love seeing the dressing table details up close. And that Secretaire Bookcase? Wow. It’s gorgeous. I’m glad you like the pieces that I decided to highlight. The dressing table was so cool. It had all these small compartments on the top to hold cosmetics, perfumes, combs, patches and decorative hair accessories. It was so easy to imagine a lady sitting before it, attended by her abigail. Thank you for sharing your love of antiques with us. I recently did a bit of research on antique furniture with secret compartments, but have no real knowledge on the subject! .